When we were young and broke my sister Annie and I often made our own soft cheese from yogurt by draining it through a j-cloth overnight and adding whatever spices and herbs we had to hand. We served this in rough terracotta bowls with toasted pittas and the cheapest red wine we could lay our hands on. Happy days indeed. I have noticed lately that labneh, as this is what it is called, is appearing on restaurant menus all over the place. It’s a bit of a shock to know that you have been around so long that you see a trend coming round for the second time. Still, I reckon after all these years it’s about time I had a go at making it again. Labneh is a classic Middle Eastern staple and is essentially Greek yogurt salted then strained overnight to remove the whey. This can be served very simply with a slick of good olive oil, or flavoured in many ways. I love it chilli spiced and scattered with pomegranate seeds, or scattered with torn mint or any other soft summery herbs- coriander, chives, basil, chervil and dill are all good. Follow my step-by-step recipe and or pick one of my other suggestions for finishing it off or go off piste and do your own thing. Tip a 500ml tub of greek yogurt(sheeps, goats or cows) into a bowl. If you want to go superhealthy use 0%- it works very well. Stir in 1 tsp sea salt. Set a sieve over a bowl or jug and line the sieve with muslin or a new piece of j-cloth. 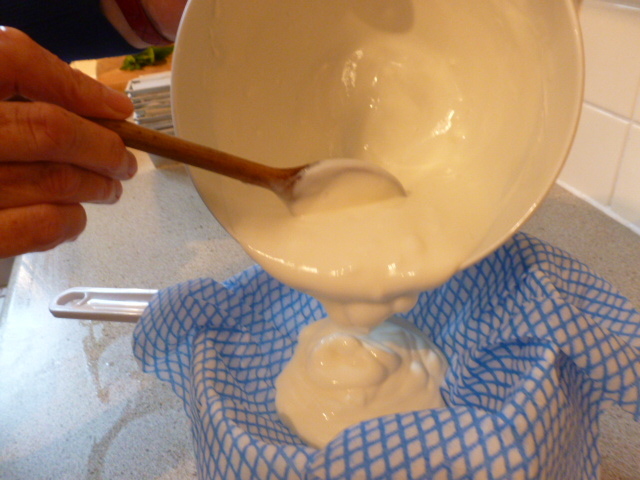 Pour the yogurt into the lined sieve. Set the bowl on a tray to catch any leakage then put the whole thing in the fridge overnight until the whey has drained out and you are left with a stiff cheese. Tip the cheese into a bowl and stir lightly. Heat a little olive oil in a small pan, add 1 tsp cumin seeds and fry for a minute or two until they start to give off their aroma. Add a chopped or thinly sliced clove of garlic and fry briefly. Remove from the heat and stir in a finely chopped red chilli. Cool slightly then fold three quarters into the cheese. 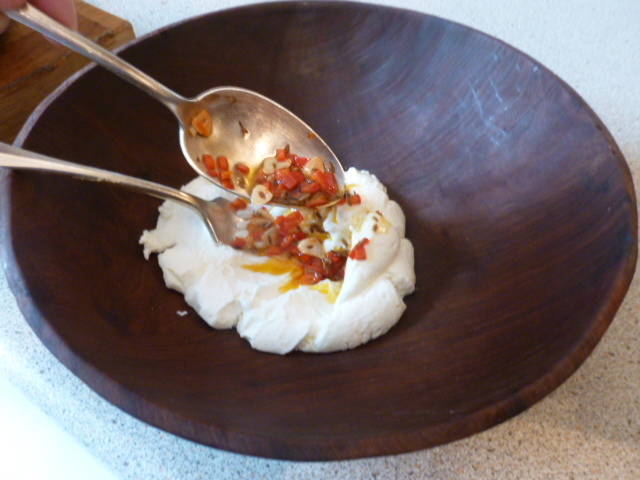 Spoon into a bowl and scatter with the remaining mix, and a little more olive oil if liked. a few chopped black olives, a teaspoon of capers and a few shreds of orange zest with a little olive oil stirred through. 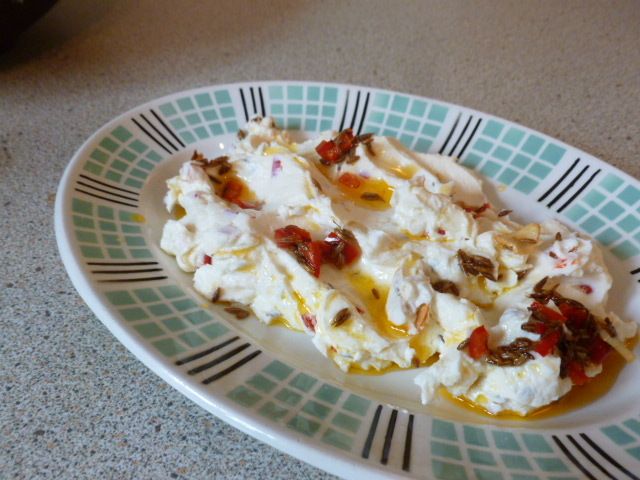 This entry was posted in veggie and tagged cheese, chilli, Greece, mezze, pittas, red wine, yogurt on 2nd June 2015 by marycadogan.